When the back and forth linear motion begins, we start increasing the frequency and amplitude until the target values are achieved, at which time they are maintained for steady-state motion. Forge force, or the pressure exerted when the two parts make contact, can be applied at the start of the relative motion or it can be applied once the steady-state motion is achieved. The forge force and the oscillation will be held until a certain amount of upset is achieved. Upset occurs when the two materials are pushed into one another, heated by friction, and experience material softening. The soft material is expelled from the weld interface in the form of flash, and this flow of plasticized material makes the two components shorter in length. The loss of length is called upset. The forge force controls how quickly the energy is converted — the power input of the weld. The power input is held until the desired upset occurs, which can vary based on the application. Once that happens, the frequency and amplitude are ramped down to a final position, aligning the two components in their final relative position for the finished part, while maintaining forge force; resulting in the correct amount of upset and a completed solid-state weld. The linear process can be altered to accommodate different incoming part geometries. We can decrease the amount of forge force, which changes the rate of power input going into the weld, resulting in slower rate of upset. To achieve the desired amount of upset, the part will need to be oscillated for a longer period of time. Inversely, if the forge force is increased, the power input is increased. This will decrease the weld time by achieving the desired upset in less time. Varying the forge force and power input allows us to successfully weld a variety of parts. For delicate parts that can’t handle high process forces during the early stages, a lower forge force can be used. This will extend the weld time but the weld will be created successfully with no part deformation. For more robust parts, a higher forge force can be applied at the beginning which will decrease the overall cycle time of the weld, bonding the parts more quickly. MTI can design machines to perform either of these power input rates based on your specific applications. We specialize in engineering new solutions based on customer requests. We want you to understand our processes because we know that they can help you. We’ll build a machine that makes your part, we’ll make the part for you, or we’ll help you make the part even better. 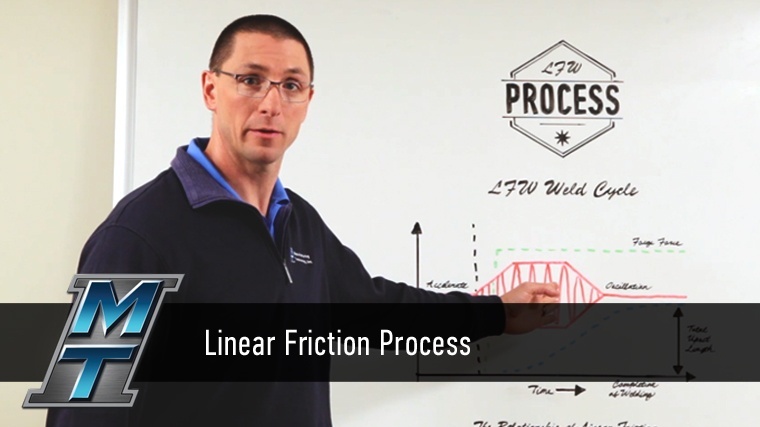 Learn more about linear friction welding or watch how friction weldingcan be put to work for you.